During the VNUS Closure™ procedure, the patient is placed under oral sedation. A small, sterile catheter is inserted into the diseased vein. 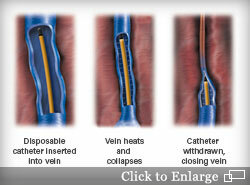 Using radiofrequency ablation, the catheter quickly heats the vein, causing it to collapse and seal shut. The blood flow is redirected to the remaining, healthy veins. The procedure is performed in segments, and is usually completed in only a few minutes. Following the procedure, a bandage is placed on the insertion site, and a compression stocking is used to aid healing. You may be encouraged to refrain from strenuous activity for a period of time. Most patients resume normal activities within one day. Most patients report minimal to no scarring, bruising or swelling. A study on post-closure patients who remained free of venous reflux for one year revealed that 92% were still reflux-free after five years. Click the video below to learn more about VNUS Closure procedure.